The Shape of Planes to Come? In other words, I am all for anything that will improve air travel technology, especially when it comes to saving the planet. Let’s hope that this “wide load” look will also make aisles wider, so you don’t have to compete with that inconvenient drink cart when you want to use the bathroom. 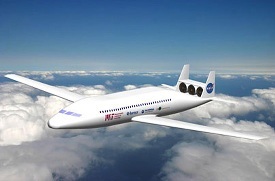 Who knows when this plane will roll off the assembly lines at Boeing or other major aeronautical corporation, but if this is the concept plane of 2030, this is quite a while. So let’s ask Coolest Gadget readers, how would you improve airplane travel? Leave an answer in the Comment box. Improving airline travel needs to be taken on a wider outlook of overall continental travel. Passenger rail service should be designed to compliment air service by developing routs between major cities such as Albuquerque and Denver. Short flights are profit off-sets to major airlines and short flights cause a lot of unnecessary traffic in routs better served by rail. America needs to re-think Amtrak top down. 1. My air travel experiences would be improved if the loading and unloading of passengers was expedited–perhaps by using more than one door. I’m 6’6″ tall and I would like is more leg room. Still, this is the next step we need to see in the greening of air travel in and of itself. I don’t think the A380 offers enough of an advantage over the 747 (even the 8 variant) to be considered satisfactory. The 787 (and A350) are steps to break down the more egregious wastes of the hub-and-spoke system with greener point-to-point travel; now what we need to do is find a way to get 1500 people from LA to Beijing or London efficiently. I don’t think they’ll find a way to make current jumbo airframes half again as efficient. Boeing is doing studies now on military-oriented giant flying wings; let’s hope market pressure might bring these airframes into the commercial sphere quickly. I saw a Discovery Channel special on future aircraft of this design; the seating resembled a large theatre or church, each row having maybe six aisles, and all outside viewing provided by video screens. The Window Seat will eventually become an anachronism. what i want? a view of the outside itself. at first i was gonna say ‘top down’ like those fancy-looking cars. but i’ve seen that movie–anywyas, obviously the air resistance would be hard to bear. so how’s about glass? thinking again; won’t be pleasant to see a bird ram dead into what was supposedly air..then what about that um, two way mirror thing? you can look out and uh..the birds can look at themselves. netherless, i just wanted to look at the sky while in flight is all. i like how it’s fuel effecient and quiet..though silence might be a bit unerving, i could just turn on some music. but why is it so wide? just to accomadate the the engines at the back?